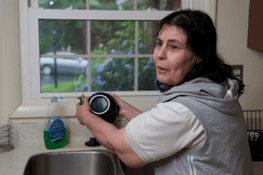 We provide housing supports to adults that are referred by DDA. Our homes are beautifully decorated according to people personal styles and are located within the suburbs of Prince George’s county. Within our services, we make great efforts to maintain and continue the family ties of the individuals we support, by including his/her family in all aspects of the person’s life. We tailor the services provided to meet the expressed wishes of the individual. We strongly encourage participation in community outings.These outings are not limited to local venues and we assist and promote travel outside of a person’s local dwelling.